The last remnants of my oldest daughter’s high school career are seen on our couch. Every school day since middle school, she has placed her backpack on that couch, so that she could grab it on her way out. Early on, I could be seen walking her to the bus stop. A year later that wasn’t cool and I was relegated to the front porch, just watching the bus go by. Fast forward to high school, where she was sometimes up and out of the house before I even woke up. And some mornings, the goodbye was a “May I borrow the car?”. I will miss the sight of her heavy backpack on the couch. Next year as she begins college at Montco., she may not even use a backpack and a few years after, may not even be home. I’ve cherished watching her backpack grow – with knowledge and independence into the mature backpack that it is – Ready to take on the world (which coincidentally is right smack next to it!). What are they and can they lead me to my center of being? The five koshas, or ‘layers’ of the body, constitute a map for navigating the inner journey. When you are heading into new territory, it is helpful to have a map. Hiking in Yosemite, you need a topography map showing the mountainous terrain. In New York City, you need to know the city blocks and major sites to orient yourself. Within yoga, a different guide is needed—one that charts the landscape of the self. The koshas, “layers” or “sheaths,” make up one such map, charted by yogic sages some 3,000 years ago. Written about in the Upanishads, the kosha model navigates an inner journey—starting from the periphery of the body and moving towards the core of the self: the embodied soul. While this may sound esoteric, the koshas are both a practical and profound contemplative tool that can help you deepen your yoga practice and the quality of your participation in life. You can use the kosha map the same way that you would when you travel—to orient yourself before you head out on the journey of your practice or when you are getting lost or stuck (e.g., in the chatter of the mind or in the discomfort of a pose). As we explore the koshas, you will find that you have been here before, and that your final destination, the anandamaya kosha, is the body of bliss. From the kosha perspective, yoga helps us bring body, breath, mind, wisdom, and spirit (bliss) into harmony. Like a tapestry, the koshas are interwoven layers. You have no doubt experienced this in your own body: When you are tense or strained, your breath becomes shallow, your mind becomes easily agitated, and wisdom and joy seem far away. When you are filled with joy and communion with life, these feelings permeate your entire being. Separating the strands of the tapestry is a way to look at how your whole being can become integrated or in discord. The kosha map is not a rigid truth but a template for exploring the mystery of being alive. Let’s bring the koshas to life now by seeing how this map applies to hatha yoga practice grounded in asana. The first layer of the koshas is always where you begin your journey. It situates you in the present moment of your body like the arrow on a map that says “you are here.” Take one of your hands and connect with a chunk of your thigh, arm, or belly. You are touching the annamaya kosha—your physical self—the first layer of skin, muscle tissue, bones, and organs. The annamaya kosha is often referred to as the “gross” body (sthula-sarira)—the tangible part of yourself that you can mostly see, touch, and feel. Annamaya means “food body,” and there are long passages in theUpanishads drilling in this realization that we are composed of food from the earth, a beneficial contemplation that helps you pay attention to what you feed your first kosha. Like having good fertilizer for your top soil, all of the layers of yourself will benefit from a healthy, balanced diet. Just eat a funky meal or dubious bon bon and watch the changes in your breath and mental body. In the beginning of your yoga practice, a lot of time is spent exploring your physical body. The first step is becoming aware of the entire field of your body from head to toe and all the little crevices that are highlighted through yoga postures, such as the arches of your feet and the side ribs. Learning how to align your joints, bones, and spine, engage your muscles, sense your skin, and even become aware of what is happening to your organs and endocrine system within the poses teaches you to harmonize your first kosha. When I teach yoga or do my own practice, I start with a keen awareness of the first kosha—the body sensations—to make the more subtle layers of the self more accessible. In other words, if you want to deepen your breath or affect your state of mind, you have to honor and pass through the gateway of the physical body. The next three layers of the self are considered to be part of the subtle body or suksma-sarira, as they are unseen and cannot be tangibly grasped. They can, however, be felt, and they have a profound effect on the physical body: You would perish if your pranamaya kosha, or breath body, ceased to function. Throughout the day the breath body can go unnoticed and become limited in range, like a caged bird that forgets how to fly. To experience the pranamaya kosha, contemplate the reality of how your next inhalation literally circulates through your entire body through the oxygen in your bloodstream. On a physiological level, the layer of prana refers to your circulatory and respiratory systems—the rivers of life flowing in you—as well as to the flow of feelings in your body. The system of yogic breathing exercises called pranayama is designed to increase and cultivate the quality of the pranic body. When you start to know where you are in your physical body through the alignment of the poses, you will have more freedom to explore the flow of your breath. By shifting to deep, slow, and rhythmic breathing in your yoga practice, you are becoming conscious of and affecting this second kosha. As you increase the amount of oxygen in your body, this pranic body starts to come alive. The coordination of your inhalation and exhalation with the movements of your physical body, as in the Sun Salutations, is one of the ways in which the physical body and breath body become synchronized with the mental body (concentration and awareness). This third layer, the manomaya kosha, corresponds to your nervous system and expresses itself as waves of thought or awareness. How active this third layer is becomes apparent within the stillness of a yoga pose: Try resting your eyes on a point and concentrating on the sensation of your breath rising and falling in your chest. See how long it takes before a thought-wave, or vritti,passes by. Often our minds are as overloaded as a freeway in Los Angeles, constricting the flow of your journey or yoga practice. If your mind is obsessed or is going in different directions, your breath becomes erratic and your sense of physical ease and balance wavers. Your breath can serve as a bridge between your body and mind. Expanded breath = Expanded mind = A sense of openness in the body. For most of us, our yoga practice is devoted to learning how to get the flow of these first three layers happening. Like knowing the best route home, observation of how these three layers interact in your practice will also help in the flow of your daily life. Many teachers and students use ujjayi breathing during yoga practice to find this balance. Drawing the breath over the back of the throat helps to focus the mind and coordinate your movements within and between asanas. This is not a VIP-only area. Throughout your life, you have accessed this part of yourself. Children go there regularly, as do musicians and dancers. And so do beginning yoga students. Whether we touch this bliss body every day or in every practice is not the point of the journey. Sometimes we make it through the gates or to the top of the trail, sometimes not. Sometimes we find ourselves more complex and difficult to unravel and other days we shift easily through the layers of ourselves. Just keep the center in your inner horizon. Shiva Rea teaches flow (vinyasa) based yoga integrating alignment and intuition, strength and fluidity, meditation and wisdom in action at Yoga Works in Santa Monica, California. She is the author of the home practice CD, Yoga Sanctuary, and leads workshops and adventure retreats worldwide. She can be contacted through www.yogadventures.com. 2 bolster fold blanket placed lengthwise on mat on top of each other. One blanket at end of mat for ankle support. Make roll for ankle support. Rest of that blanket fills in gap where shin does not meet the floor. Make sure no blanket is on knee. This supports the knee in the pose. Top bolster folded blanket roll towards you in a wider roll to fit in chest and shoulder area. One more blanket folded so that its height is the same as the two bolster folded blankets. 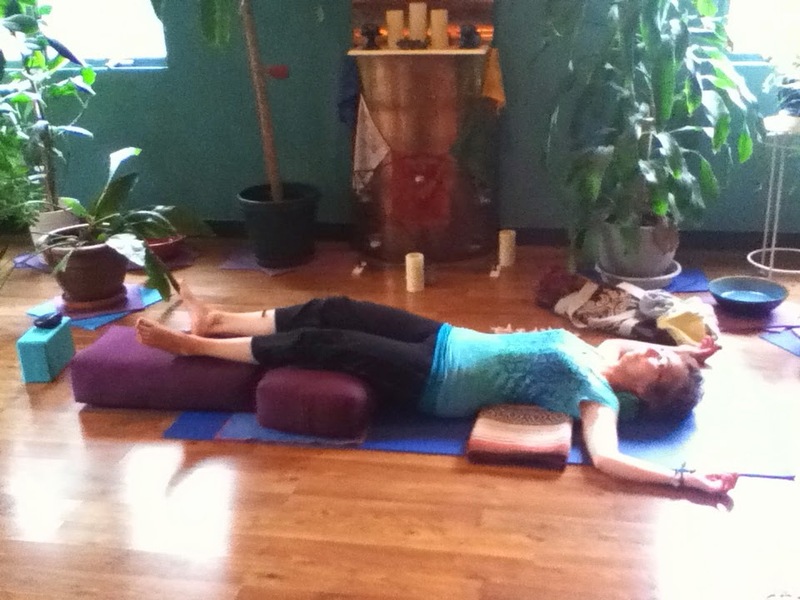 Come to all fours straddling the props, release to forearms and then fully recline on props. Ankles rest on small roll at end of mat, shins supported by the rest of that blanket. Rest the rest of your body at hip crease on the bolster fold blankets and lay chest on wider roll of top blanket. Head rests on additional blanket at top, turned to the side. Arms come out to the sides, releasing shoulders down the back and away from the ears. Placing an eye pillow or stuffed animal in palms as they face floor is very grounding and comfortable. Additional blankets for pillows tucked in as needed with student to create boundaries or make more comfortable. Thanks for checking into the blog and the nuggets of information that I share as well as my musings on a myriad of subjects. It truly is a work of love as I never know what direction I am heading. I take a summer hiatus but that is my time to revamp, reconnect and enjoy summer. A few more blogs to finish out June and then see you in September. Nice to meet you as well at Shine!